This very small device, only 29x29x10mm, can be used with almost any radio remote control in the market which transmit in a frequency between 288 MHz and 868 MHz, AM and FM, fixed and rolling codes. It's very easy to be installed, using only two wires for the power supply and two opto-coupled wires which should be connected in parallel with the electronic board that should be remotely controlled. The operating frequency, shown in the table, can be simply programmed using the Prog button, as like as the type of output which should be programmed as bistable, hold-to-run and as timer programmed from 250ms to 60 minutes. 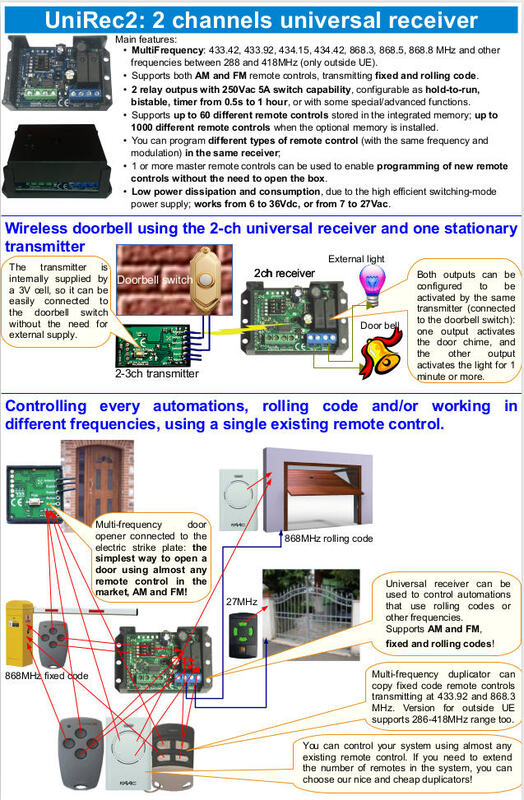 In the same receiver it's possible to learn up to 60 different remote controls, even if different brand/model, both fixed and rolling code: the number of remote controls depends by the code complex, so, for example, it's possible to manage 40 KeeLoq rolling code remote controls. When a known code is transmitted by the remote control, Creasol UniRec1 shorts the switch wires, simulating a pushbutton. The output is opto-insulated: maximum admitted current is 30mA and maximum voltage 40Vdc. enhance the number and type of remote controls that can be used with a gate or garage door opener, by using different brand of existing remote controls even if they transmit in different frequencies. Questa application note mostra come sia possibile collegare la ricevente universale Creasol UniRec1 ad una automazione in modo che sia possibile con un unico radiocomando controllare due diverse automazioni. Nell'esempio, si vuole utilizzare il radiocomando Hormann per controllare un garage Hormann ed un cancello Ditec, tuttavia l'esempio è generalizzabile a quasi ogni tipo di automazione. 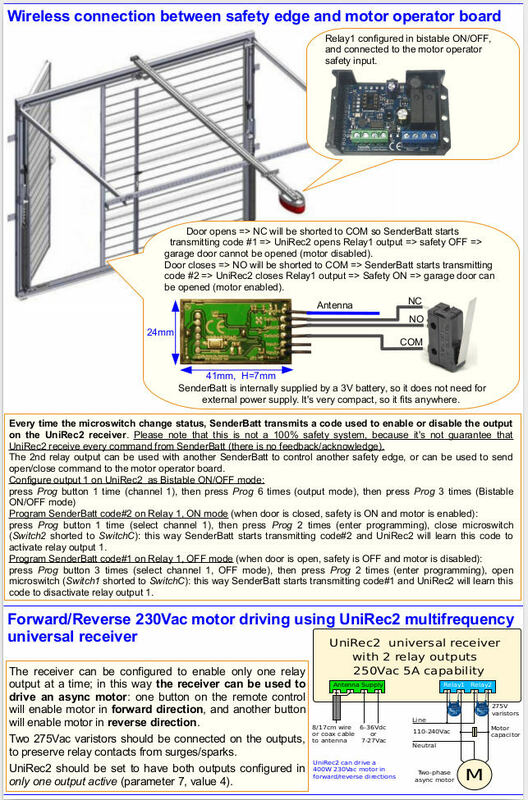 This application note shows how it's possible to connect the universal receiver Creasol UniRec1 to an automation so it's possible with a single remote control to activate two different automations. In this example it's shown how it's possible to use a Hormann remote control to open a garage door Hormann and a gate Ditec. Cette note d'application montre comment il est possible de connecter le récepteur universel Creasol UniRec1 à une automatisation de sorte qu'il est possible avec une seule télécommande pour activer deux différents automatismes. Dans cet exemple, il a montré comment il est possible d'utiliser un contrôle Hormann télécommande pour ouvrir une porte de garage Hormann et un Ditec porte. Diese Application Note zeigt, wie es möglich ist, den universellen Empfänger Creasol UniRec1 an ein Automatisierungssystem zu verbinden, so es möglich, mit einer einzigen Fernbedienung ist auf zwei verschiedene Automatisierungen aktivieren. In diesem Beispiel ist es gezeigt, wie es möglich ist, eine Hormann Fernbedienung verwenden, um ein Garagentor Hormann und eine Gate-Ditec öffnen. Esta nota de aplicación muestra cómo es posible conectar el receptor universal Creasol UniRec1 a una automatización por lo que es posible con un solo mando a distancia para activar dos diferentes automatizaciones. En este ejemplo se muestra cómo es posible utilizar un mando a distancia Hormann para abrir una puerta de garaje Hormann y un Ditec puerta. Esta nota de aplicação mostra como é possível conectar o receptor universal Creasol UniRec1 para uma automatização por isso é possível com um único controle remoto para ativar duas automações diferente. Neste exemplo é mostrado como é possível usar um controle remoto Hormann para abrir uma porta de garagem Hormann e Ditec portão.